my sponsors are da bomb. did i just say that? you all have to finish your christmas shopping right about now and i have got just the places for you to do that, mmkay? check 'em! coupon code: 50% off with code 50TKV21A until november 30th. head on over to each of these lovely shops and let me know your favorite item. winner chosen by random.org and announced monday. From Katie's Wish, I love the Printable Paper Kit Into the Woods. oooh i'd love to win. so many items for one winner!! woooo. i think the Scripture Art - Christian Wall Art - Be Still - Psalm 46:10 - 9x12 Canvas Painting - Gift is my favorite from the grace shop. but i love all of her scripture gifts. the Blossom Trio Headband- Ella - mustard grey cream is my favorite from sugar blossom. My favorite item from Lovely Little Whimsy is the ruffled muslin stretch handband. Cute! i love the Hand Embroidery Patterns for Keepsake Thank You, Thinking of You, Get Well and Anniversary Gifts with Bible Verses from true vine. the cupcake gift pack is my favorite from the sweet shop! the Chevrons Digital Paper Commercial Use Kit // 12x12 inch 300 dpi jpgs CU is my favorite from katieswish. One of my favorite hymns references Exodus 15:2, so of course my favorite item from GraceforGrace is The Lord is my Strength and my Song Art, in gray. Amazing creativity! Love it all! all these ladies are so talented! i love all the stuff they are making! grace for grace has an awesome shine your light and let the whole world see print. wow. that's an awesome give away and a ton of great shops- several i had not seen before! the purple coffee sleeve from race towards joy is super cute! i like the advent calender on true vine, its so creative and pretty. i like that you can reuse it each year. the ruffled muslin stretch headband over on love little whimsy i think is my fav, very versatile. the gluten free vegan spice cupcake mix on sugar mamma bakeshop looks delish! love the styles and colors of the vintage whimsy scrapbook kit by katies wish. Love this giveaway. Thanks Danielle and sponsers! Wow, what a fab group of sponsors! That first shop that has the tree with Christ as the roots brought tears to my eyes. Beautiful. Besides the tree canvas my other favorite is the Scripture Art - Christian Art - 12x12 Customized Wrapped Canvas in Grace for Grace. 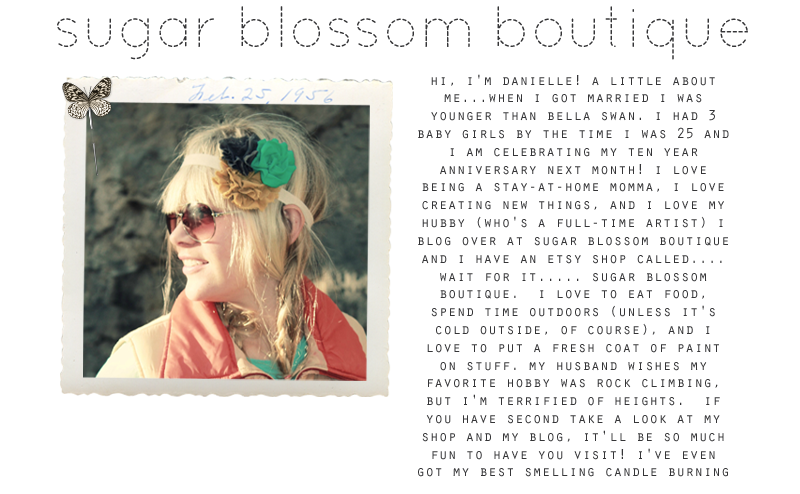 I visited Small Bird Studios blog and would love a new blog design! I like the Skinny Boho Headband- Chocolate from Sugar Blossom B.
I would love to try a coffee sleeve from Racing Toward Joy. I like the braided fabric cuffs from Lovely Little Whimsy. I like the Deep Water Digital Paper kit from Katie's Wish. so excited about this one! woot! They all look like very talented ladies. :) Thanks for the chance to win! sugar momma's gluten free, vegan cupcakes have me curious! i have some friends i'd love to share those with! rock climbers favorite headband from sugar blossoms is totally my fave...even though i'm not a rock climber. the mini felt advent pennants from the true vine - adorable. wow those are da bomb! Wow, that is a giveaway post! Thanks for the chance to win! girl! amazing giveaway! :) You're great! you do have awesome sponsors! 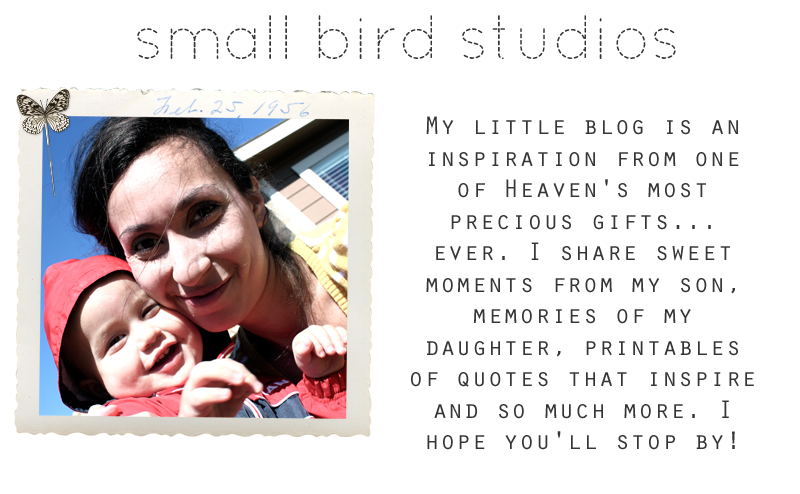 small bird studios--i love all the premade blog designs! From the Sugar Blossom Boutique, I love the Skinny Boho Headband in mustard. My sister would LOVE the Be Still painting from graceforgrace. 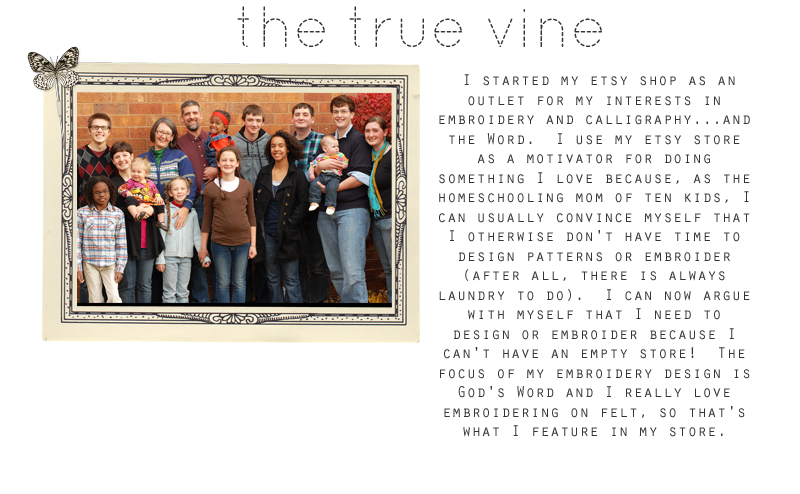 The Thanksgiving Mini Pennant from The True Vine is beyond cute! I love the ruffled muslin stretch headband from lovely little whimsy. I'm in love with the Spring Spirit set from Katie's Wish. So fun! So many talented ladies...well needed inspiration!! i all looks so fabulous! I have actually made the beautiful Advent Banner from The True Vine and it exceeded my expectations! I love all of these items! Wow, I can't believe how awesome these shops are! 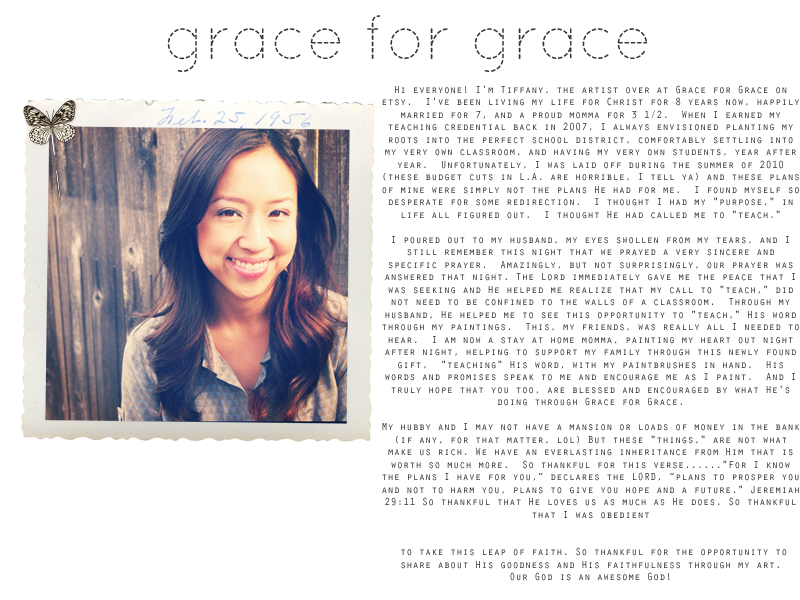 Grace for Grace had me at "faith based gifts". The "Two Are Better Than One" wood block is just gorgeous. 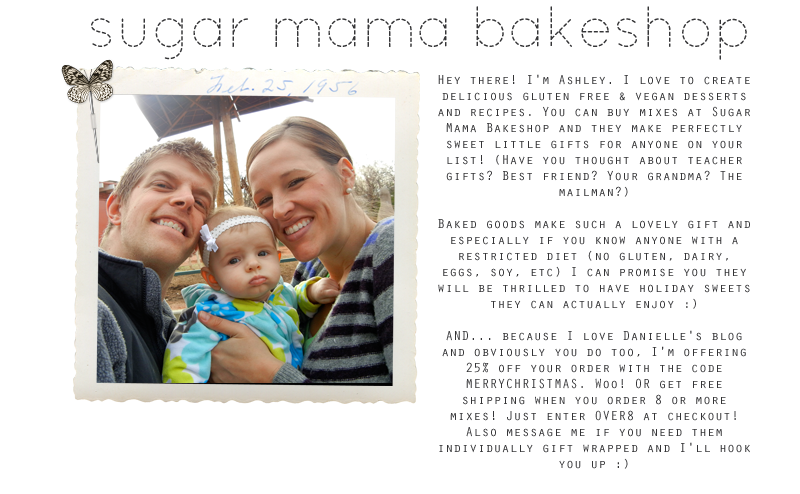 The Cupcake Gift Pack from Sugar Mama Bakeshop would be so much fun to send to a friend from out of town. Katie's Wish:so hard to pick a fave, but love the Apple Crumb (I think that was the name) digital pages! Katie's Wish is one of my favs for digital paper. I have so many of them but the one I love and have yet to get is Posh. amazing giveaways! thanks for the chance to win! 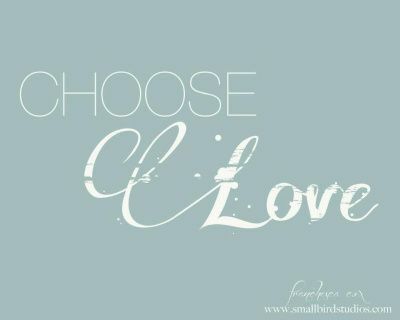 Love the create in me a pure heart from grace for grace. Love the boho headband in mustard yellow by sugar blossom. Love the advent calendar kit from the true vine. Love the braided fabric cuff from lovely little whimsy. Wow, this is one of the best giveaways! Lots of great stuff! Thanks! Oh my. Grace for Grace has some great stuff. I'm loving the As For Me and My House - Joshua 24:15 - Wood Block. I need to get that in my house. I love brown so I'm liking the Skinny Boho Headband- Chocolate from Sugar Blossom. I like the Psalm 1 Embroidery Pattern from True Vine. The whimsical fabric hanging hearts from Lovely Little Whimsy is such cuteness. Sugard Mama has some sweet looking things. I think any cupcake pack would be delicious. Wow, Katie's Wish has some awesome patterns. I really like Apple Crumb. loved reading about the sponsor's backgrounds. adorable products! oh boy! my 'wantings' list just expanded! Um, fantastical giveaway! I love following your blog! I like the fabric braided cuff in Lovley Little's shop. Sugar Blossom is one of my favs in Etsy. I really love her Boho headbands, the wide and the skinny ones. Praise HIM with my whole heart is so cool in Grace for Grace's shop! Great sponsors and beautiful items! Ooh so many lovelies! thanks for sharing. Your giveaways kill me! jkhlkjsjkdfhjsdhf...Sorry, I needed to wipe the drool off my keyboard. Ha. Thanks for sharing! These shops are amazing! Lovely! 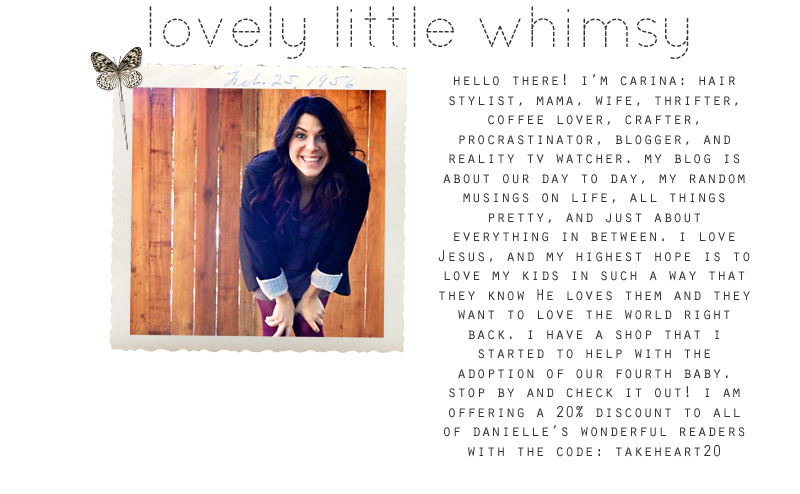 I love all the little intros, nice to "meet" so many talented creaters/mommas/writters and Christians. Thanks for hosting this giveaway! I love your giveaways.. and your DIY tutorials! I could really use some awesomely free things! Grace for Grace's signs are absolutely adorable! I would love the "Two are Better than One" on stained wood.. it would go great in the middle of all my husband and I's wedding photos! From the True Vine I really like the idea of the Advent Calendar Pennant.. My husband and I don't have a family of our own yet but I know when we do this would be SO great to have to show our kids on our tree and have each day a new lesson! Lovely Little Whimsy: I would LOVE the frayed white rosette headband.. its super cute and if I could actually give it up, it would make a great gift! Sugar Mama has some very delicious looking items.. which is why the only option for me would be the cupcake gift pack because it has so many yummy mixes! Katie's Wish has SO MANY choices. but I could really use the Sweet Jane Paper Kit.. those backgrounds just scream my style!